We really like cars from Mercedes-Benz, and we know that you like these cars no less than us. 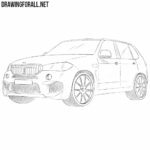 On our site there is already a huge number of drawing tutorials about various Mercedes-Benz models, and today we want to continue the line of cars from this company on our website. And as you guessed, today we will show you how to draw a Mercedes-Benz SLC. First let’s sketch out the main outlines of the car’s body. 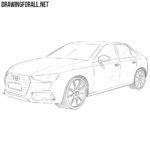 Note that today we are drawing a car without a roof, so the first step of this tutorial is very different from the first steps of conventional cars. Now let’s add the most basic outlines of the details on the body of our Mercedes-Benz SLC. 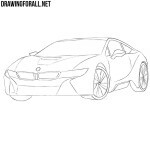 In the front part we draw the outlines of the headlights, grille and bumper. Next, draw the outlines of the wheels, mirrors and seats. Starting with this step, we will use clear and dark lines. 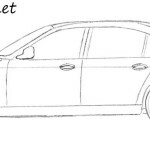 With the help of such lines draw out the outlines of the headlights and grille. In the middle of the radiator grille we draw a large Mercedes-Benz logo. Continue to work with the front part of our Mercedes-Benz SLC. Here we need to draw outlines of the bumper, number plate and a line of the hood. Also here we remove all unnecessary guidelines from the front of the car. Let’s now move on to the top of our car. Continuing the line of the bonnet carefully draw out the windshield. Next, draw the visible parts of the seats and rear-view mirrors. Here we need to draw out the back of the car, the outline of the door and the door handle. Do not forget to draw an air intake on the side of the body. 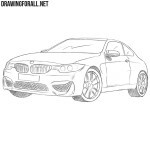 Here we will have to try hard, since we will draw wheels and arches. They should be the most rounded and smooth, as in our example. Now we’ll draw the rims. 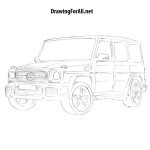 Note that we have drawn classic rims of Mercedes-Benz cars, but you can of course draw any design of rims that you like. With the help of intersecting lines create a texture of the radiator grille. Next add some shadows and glare using dense hatching, as our artists did. If you followed our instructions exactly, now you know how to draw a Mercedes-Benz SLC. But if this lesson seemed too difficult for you, then visit other lessons on our website, because we have a lot of easier lessons about cars. Also do not forget to write your opinion about this lesson below this article or in our social networks.